Mike Spagat is a professor of economics at Royal Holloway College where he does quantitative research on war. 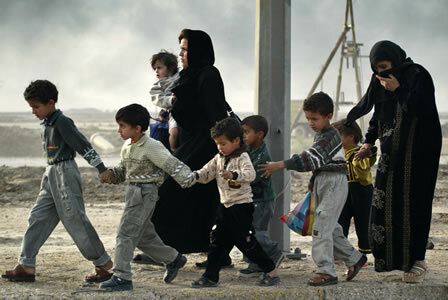 Read his press release on Blair’s distortion of child mortality rates in Iraq here. The chapter on civilian casualties in the Chilcot report is stuffed with interesting material to the point that I don’t know where to start. So I guess I’ll make a somewhat random choice and start with the internal UK discussion on whether or not to compile and release data on civilian casualties in the Iraq war. Iraq Body Count (IBC), my long-time collaborators, have produced a must-read piece on this subject which influences a lot what I write below. One thing about the report that surprises me is is the strength and persistence of the interest from Tony Blair about civilian casualties. As argued by IBC, much of his interest seems to derive from the political/propaganda role of such figures, i.e., winning the “blame game” as IBC puts it. But Blair dis ask repeatedly over a period of several years for casualty information. In other words, the UK was sitting on plenty of useful raw information that should have been collated and released. It is true that such data would have been incomplete and flawed but the information could have been usefully triangulated with other data to clarify the humanitarian situation in Iraq. Indeed, the MoD argument is such a transparent case of making the best into the enemy of the good that I find it hard to believe that MoD officials offered it sincerely. Thus, Straw assumes that Coalition forces are not killing civilians needlessly and in large numbers and wants to be supplied with numbers he can use to drive home these facts, as he sees them, to the general public. If the reality was that the Coalition was needlessly killing many civilians then the UK government was intentionally blinding itself to this fact, thereby foreclosing the possibility of making improvements. The UK government would disclose civilian casualty figures to its citizens if these figures were good news, thereby betraying the public trust and forcing people to assume the worst in future when data are not made available. There is more in the report on this subject but I think the essence and outcome of the discussion are clear. The UK did not compile or release civilian casualty statistics because such figures would not have been perfect and because government officials were afraid of what such figures would show. Mike Spagat blogs at War, Numbers and Human Losses, republished with kind permission.